Ethene (CH2=CH2) contains two trigonal planar carbon atoms. Each carbon is bonded to two hydrogens as well as the other carbon. Figure CA2.1. 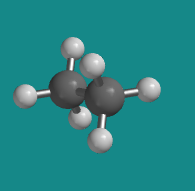 A ball-and-stick model of ethene. Go to Animation CA2.1. 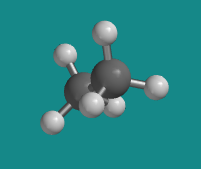 A three-dimensional model of ethene. From molecular orbital considerations, the two trigonal carbons must be coplanar with each other in order to maximize carbon-carbon pi bonding. As a result, the entire molecule must be planar. Figure CA2.1. Orbital pictures of ethene showing rotational freedom about the sigma bond (left) but lack of rotational freedom about the pi bond (right). Ethane (CH3-CH3) is very similar to ethene, except that each carbon is tetrahedral and is bonded to three hydrogen atoms. There is no need to arrange the two carbon atoms with a certain orientation to each other because the sigma bond holding the two carbons together is symmetric about the C-C axis. As a result, there are a number of ways the two ends of the molecules could be oriented. Figure CA2.2. Orbital pictures of ethane showing rotational freedom about the sigma bond. Figure CA2.3. Ball-and-stick model of ethane in a "staggered conformation". Go to Animation CA2.2. A three-dimensional model of ethane in staggered conformer. Figure CA2.4. Ball-and-stick model of ethane in an "eclipsed conformation". Go to Animation CA2.3. A three-dimensional model of ethane in eclipsed conformation. Working with models often reflects reality quite well. While holding a model of ethane, you could grab one CH3 group and twist it while holding the other one still, and as a result you could put the molecule into different poses. The ethane model is flexible via rotation around the C-C bond. Ethane can adopt different shapes, because one end of the molecule can rotate with respect to the other. These different shapes are seen most dramatically while viewing ethane along the carbon-carbon bond. From this vantage point, rotation about the C-C bond results in a changing shape that alternates between a six-pointed star and a three-pointed one. In the three-pointed star, some of the hydrogens are hidden or eclipsed behind the corresponding hydrogens on the carbon that is closest to the viewer; in the six pointed star they have come out into view again. A drawing that shows a molecule viewed along the axis of a rotating bond is called a Newman Projection. The different shapes obtained via bond rotation are called conformations. The angle between a specific C-H bond on one carbon and a specific C-H bond on another carbon, when viewed in a Newman projection, is called a dihedral angle. Figure CA2.3. A view of ethane seen by looking along the C-C bond axis. This type of rendering is called a "Newman Projection". The conformation in which the Newman projection shows all six hydrogens of ethane in plain view is a staggered conformation. The conformation in which three of the hydrogens are hidden behind the others is an eclipsed conformation. In the eclipsed conformation, the dihedral angle could be 0, 120, 240 or 360 degrees; in a staggered conformer, the dihedral angle could be 60, 180, 300 degrees. Figure CA2.4. Newman projections showing staggered (left) and eclipsed conformations (right) of ethane. Many conformations of ethane are possible, but not all of these conformations are equally likely. The most probable conformation is a staggered one. Staggered conformations are lower in energy than eclipsed ones. The term "conformer" is used for a stable conformation, one that has a practical chance of occurring. The energy barrier to rotation about the C-C bond in an ethane molecule can be measured using microwave spectroscopy. This technique is similar to infrared spectroscopy but the molecular motion connected to microwaves is bond rotation rather than vibration. Experimentally, the barrier to rotation is about 3 kcal/mol. (Keep in mind that, in chemistry, the term "experimental" gives a finding more weight, not less, because it reflects reality.) This barrier is small enough that at room temperature an ethane molecule can freely rotate, but high enough that an ethane molecule would not be found sitting in the eclipsed state. The factor that destabilizes eclipsed conformations is called torsional strain. Torsional strain in ethane apparently arises from a molecular orbital interaction between a populated C-H σ bond and the empty C-H σ* orbital on the neighbouring carbon. Figure CA2.5. Orbital pictures of ethane showing a stabilizing interaction between a populated C-H σ bond and the empty C-H σ* orbital on the neighbouring carbon. When the two C-H bonds are in the same plane but pointing in opposite directions, the orbitals have proper symmetry to interact. This is called an antiperiplanar orientation, from anti, meaning "opposite", and periplanar, meaning "in the same plane". This orientation is only possible when the neighbouring bonds are staggered. Eclipsed conformations lack this interaction and are higher in energy by about 3 kcal/mol (about 1 kcal/mol per C-H σ - σ* interaction. 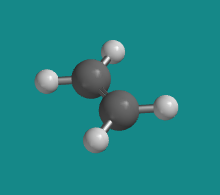 Looking at a space filling model of ethane, it seems that the overall shape difference between staggered and eclipsed ethane is pretty small. The important point is that most organic structures are not static, but flexible. Also, torsional strain is found in all carbon-carbon bonds, so we will keep using the experimental result from ethane as we build a "basis set" for understanding conformation in larger molecules.